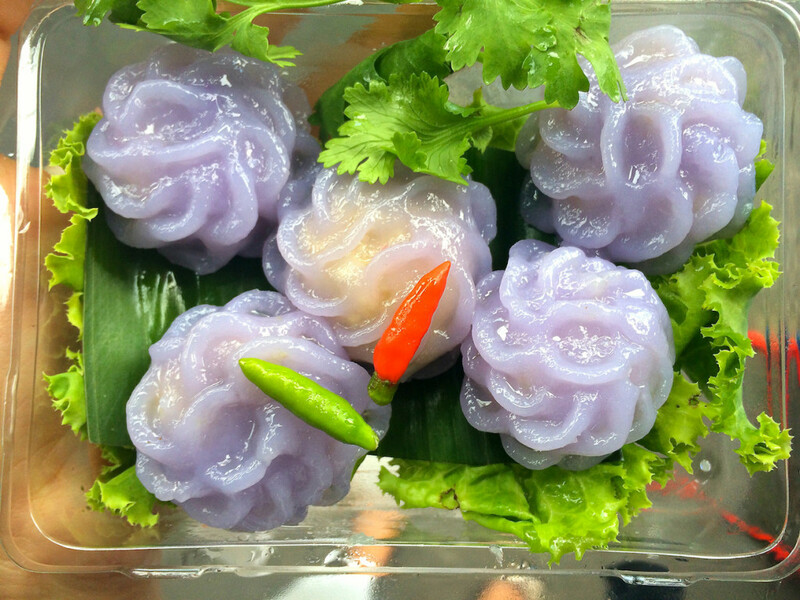 The traditional Thai delicacies, “ขนมช่อม่วง Khanom Chaw Muang” (Steamed Dumplings with Fish Meat Filling). ช่อ /châw/ means ‘bouquet or bunch’ , ม่วง /mûang/ means ‘purple’. Each dumpling is handcrafted with perfection into a rose petal for the appearance, while the taste of this appetizer is not outdone by its exterior. 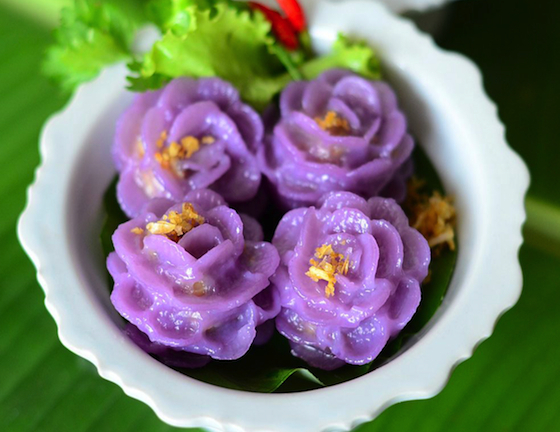 The dough, sticky yet soft, is purple from the color of the butterfly pea flower, while the fish meat is perfectly balance and aromatic. The filling can be made from pork, shrimp, crab meat or chicken stir-fried with coriander root, garlic and pepper. This royal Thai Cuisine requires refinement. It shows the unique Thai art and deserves to be preserved. A box of five dumplings I got from Emporium. 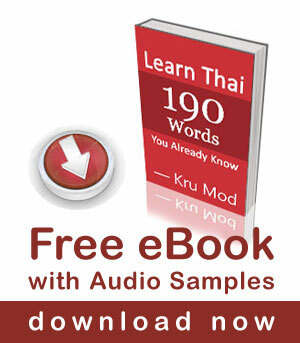 Chaw Muang is not commonly found on the street like other Thai sweets. I usually buy it from Emporium department store (Phrom Phong skytrin station). There is a stall selling all king of Thai dessert and appetizer. It is just opposite the super market on 5th floor. A box of five dumplings is only 45 Baht. 1. Heat the oil in a wok, and sauté the garlic and coriander roots until aromatic. Add the onion and cook until tender, then add the meat. Keep stirring until the mixture becomes fairly dry. Following, season with salt, sugar and pepper. Stir well and remove from heat. 2. 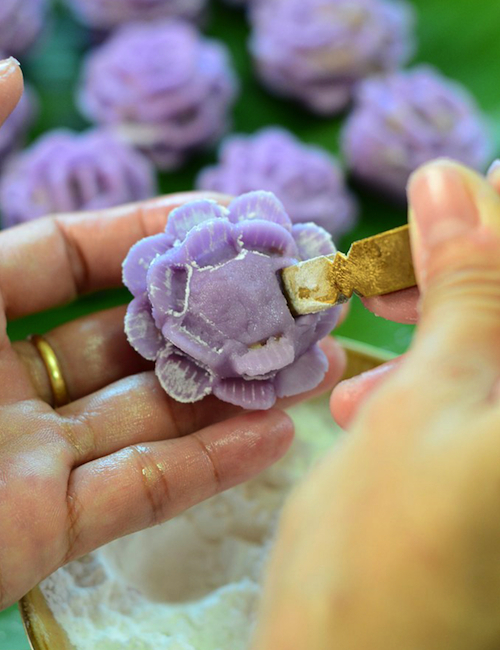 To make the dough, combine the rice flour, arrowroot starch, oil, water and butterfly pea flower juice in a saucepan. Place the saucepan over medium heat and keep stirring until the mixture binds together and dough is formed. Remove from the heat. Transfer to a mixing bowl, then dust with the tapioca starch and knead well. 3. Take a small amount of dough and shape it into a small ball then flatten it. Spoon in a little of the crab filling, wrap well and shape the dough back into a ball. 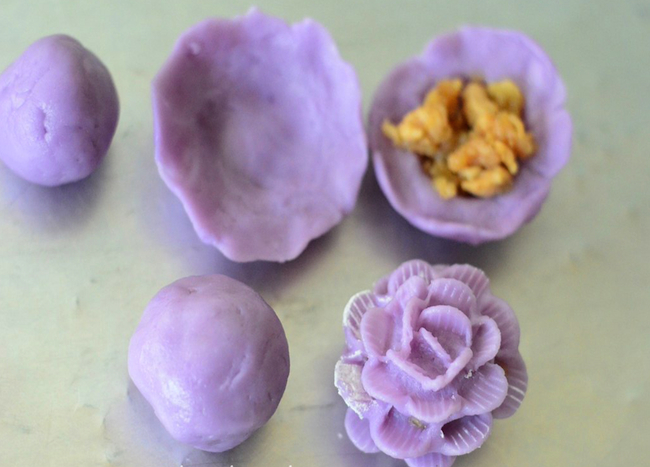 Use tweezers to pinch the dough into a petal. Continue until a flower is formed. Repeat this step until all the filling is used up. 4. Steam for about 5 minutes. Sprinkle with crisp-fried garlic and serve with lettuce and coriander. Oops. Here it is. The asterisk means it’s spicy. Have you ever heard of a dish called “bhram”? I’ve had it at an excellent Thai restaurant in Washington, DC, but I have not seen it in Bangkok. I would much appreciate any insight that you can provide.